Whether you’re running large scale breweries, micro-breweries or are even just a home brewer starting out – here at Amphorea we have a great range of wholesale beer bottles that are ideal for the mass market and home use. Plus we can offer you up to a 15% discount when you buy in bulk! 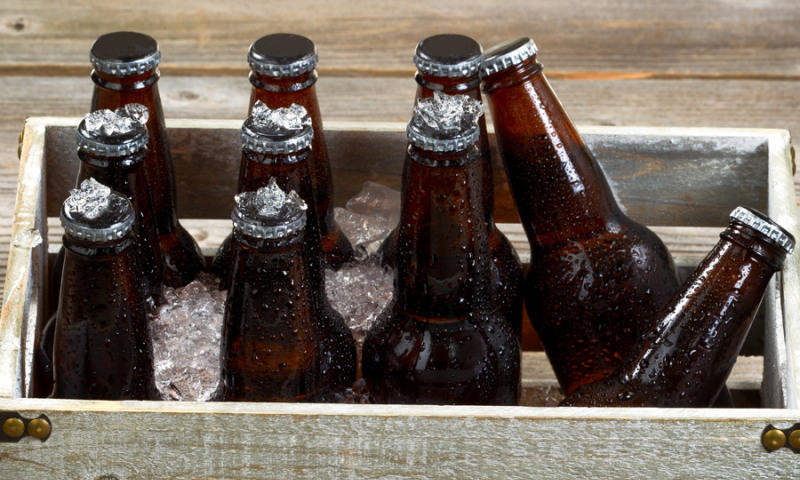 All our glass beer bottles come with crown cap closures, which can only be fitted with a capping tool. These crown caps obviously give your customers peace of mind about the quality of their beverage, whilst also giving your brand a professional look. We have a variety of classic glass beer bottles that come in the classic colours of green, amber and clear. Different beverages look better in certain coloured bottles than others, so let us talk you through our wholesale glass bottles and what beverages we recommend for them. Dark Ales are simply made to be bottled in amber glass bottles! Think Newcastle Brown Ale, London Pride, Guinness…. We have 3 different amber glass bottles to choose from which are the 330ml (1907) Amber Glass Beer Bottle, the 500ml (1909) Short Amber Glass Beer Bottle and the 500ml (1941) Tall Amber Glass Beer Bottle. They’re rustic and have an archaic vibe to them, perfect for old-school ales! Best of all, they’re made from 40% recycled materials and do not contain any harmful chemicals such as BPA or latex, so you’ll be doing your bit for the environment! Pallets of our amber glass bottle start from £235.79 each (not inc. VAT), with pallet quantities of around 1200-1800 (dependant on bottle size). With paler beverages such as lager and wheat beer, clear glass bottles are the way forward. With so many shades of lager on the market, with so many different tastes, it is important that your customers can make an informed choice about their drink. You don't really get this problem with dark ales, as they are all very similar colours. Again, we have a few different sizes of these glass bottles, from 275ml up to 500ml, so you can choose whether to bottle smaller servings or larger pint-sized servings. This is also a good option for flavoured ciders where customers would want to see the deep reds of mixed berries or the pale tones of pear and passion fruit through the bottle. The best starting price we have for our clear glass beer bottles is £235.79 (not inc. VAT) for a pallet of 1235 units of the 500ml bottle, which is just 19p per unit! What better reflects a quality apple cider than a bottle that is the colour of your main ingredient? It’s crisp, clean finish will complement the taste of your fruity concoction perfectly. We think these bottles would also suit scrumpy ciders and unique, limited edition ciders that have been made on small farms and microbreweries. We have one size of green glass bottle available at the time of this post being published (23rd August 2017) but we may have other sizes on sale in the future. The 330ml Green Glass Beer Bottle is the ideal size to include in multipacks and to be served in pubs and clubs. The starting price for a pallet containing 1805 units is is just £307.44 (not inc. VAT) - that's just 17p per bottle! Remember, to get the very best prices on our glass beer bottles, we recommend calling our friendly sales team on 0161 367 9093 where you could save up to 15% on your order!